Once in awhile you get shown the light in the strangest of places. That’s how we've gotten to this wonderful edition of Reminiscing. Where was that strange place, you ask? 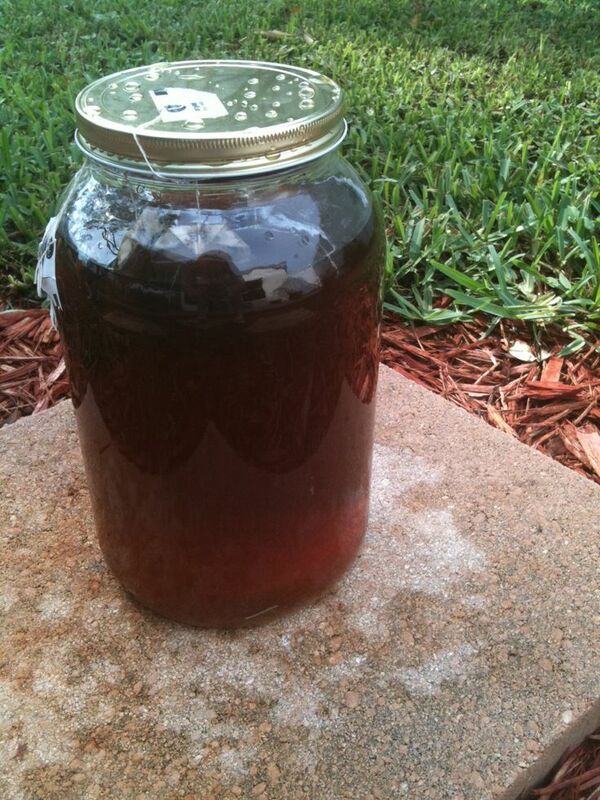 It came in the form of a glass jar full of water and tea bags that was on the front porch in the sun. How does sun tea give birth to an article on the Cooler? I'm about to tell you. So, sit back and relax. My grandmother loved to drink tea. Hot or cold, she would call it “tee-ah.” We’d pull into her driveway in the summertime and there would be three or four glass jars of tea brewing at any one time. The coolest thing about them was that they were brewing in glass Miracle Whip jars, complete with the original lids. I would love to know whatever happened to those jars. They would be perfect for brewing tea still. After placing my own jar outside to brew some tea (In a 2-quart Mason jar -- almost as cool as the Miracle Whip jars), I stopped to think about some of the other strange things that family members recycled over the years for various purposes. There have been some odd ones, but they all seem practical now that I look back. My grandmother used to collect buttons. Upstairs in the north room closet, she had boxes and jars of buttons. There were several. I never could understand why she had all those buttons. Her excuse? “You never know when you’re going to need a button.” Once in awhile she’d bring out a couple of boxes or jars and just go through them. Each of the buttons had a history that she knew. “This one came off my father’s suit that he wore to his Masonic meetings.” “I used one like this on a dress I made for myself in high school.” Those stories were always interesting. One of the more interesting things at grandma’s house were the two tractor tires in the yard. One was in the side yard. The other was in the backyard. When I was little, they served as garden boxes. The hole in the center was filled with dirt and there were plants decorating the insides. In the side yard, they were flowers. In the backyard, the plants were tomatoes and cucumbers from which grandma would pick produce for a fresh lunch. I had no idea until I was older that the tires covered stumps of trees that had been taken down. It was easier to put the tires around them than to have them ground out. At MeMe’s house, there were cool little things that I have no idea whatever happened to them. In the “other room” there was a marble top table where the shelf underneath had a jar full of pennies and Green Stamps. The pennies obviously disappeared through the efforts of the grandchildren to buy candy at the corner store. The stamps? I have no idea what happened. There were sheets of those things and a little catalog. 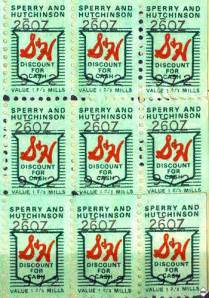 I’m sure many of you remember the S&H Stamps. They were given out as rewards for shopping at certain places and buying certain things. They had a catalog where you could buy products when redeeming the stamps. In the 1960s, the company boasted they had more stamps in circulation than the Post Office, and that their catalog was the largest in the world. We used to rifle through that catalog looking for something we could buy. We’d pretend that we had unlimited stamps, although sometimes there were so many that it seemed like it was unlimited. I’m sure those stamps were never redeemed and ended up in the garbage. I’d like to have them now, or a few of them, for posterity. There were burn barrels at the houses, too. Wendy’s grandparents had them too. All of grandma’s mail was thrown in there along with sticks and other combustible yard and house waste. She had the barrel on the property line with the farmer’s field behind her. When the pile of ashes grew too much, she’d dump them into that field. She claimed it was fertilizer and justified her free gift to the farmer as a reason to pick beans when he grew them back there. It all worked out. Speaking of fertilizer, at MeMe’s house behind the concrete pad where the garage used to be, there was rhubarb. There was a lot of rhubarb. With seven grandsons, she urged us to pee on the plants back there rather than tromp through the house. My dad says she was trying to kill the plants, but those things just grew like crazy. Who knew that sugared-up kid urine would sustain rhubarb? Those were just some of the memories that popped up while I was thinking about brewing sun tea for my own house. It’s funny how those small things trigger so many memories. Maybe next week I’ll talk about lawn jarts. You know, the real ones with metal tips. None of us were maimed physically. Like I said, that’s not a story for today. But soon. How many of your grandparents or parents had strange uses for things that stick out in your mind? Let us know. We’re always interested in stories like that. Craig Bacon found a single S&H Stamp in his desk drawer. Just one. I can’t even buy a sucker, but I can buy a dream or two with it.